I’m not a big pie baker. Not because I don’t like them, of course, but because it takes a lot of work to really do it right, and I’m still learning all of that process. Still, I love the results! I’ve made apple pies, pumpkin pies, and, most recently, a pecan pie. One thing I’ve noticed, as I’m baking, is that the crust is pretty much the same process in each pie I bake. So, I’m thinking I should write that process out in it’s own blog entry, and then I can reference it in all of my pie recipes. I used to make my pies in my 12” Dutch oven, but over time, I discovered that the 10” is better. The 12” is usually too much pie, and some ends up being spoiled. So, 10” from now on. Also, some people will bake their pies in pie tins, set inside a Dutch oven. That does make it easier to craft, and easier to lift out. However, current IDOS cookoff rules prohibit using any internal cooking devices like pans or trivets inside the Dutch ovens. Plus, I really like just baking right in the Dutch oven. I also like to serve it right from the Dutch, too, so I’m not required to lift it out whole and complete. If you want to do that, it’s not tough if you do the right trick. But first, let’s make the crust! I start simply by adding all of the ingredients into a large bowl. You can use butter or margarine, I’m told, instead of shortening, but those had other liquids in them, and they can make for less flaky crusts. I’ve always used All Purpose flour, because that’s what I’ve always had on hand. You can use pastry flour if you want. It will have less protein, and so, less gluten. 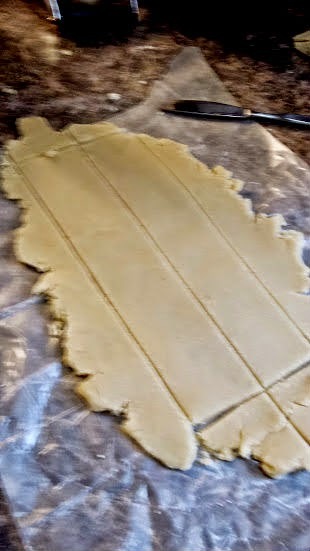 I use a pastry cutter to mix the ingredients together. Blend them all, but don’t knead, since you don’t want to build any gluten in the flour. Also, working it less with my hands keeps it cool, so the fats don’t melt. 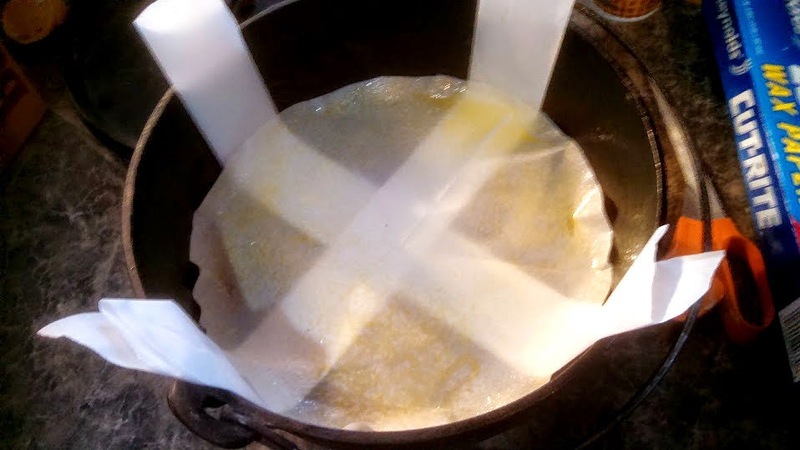 Once it’s mixed, I put it between two sheets of parchment or waxed paper and begin rolling. At this point, I’m not preparing it for the oven, but rather creating layers, so it can be rolled out quite thick. I dust it with just a little flour, and fold it in half, and then in quarters. Then, I roll it out again. A little more flour, a folding, and another rolling. I do that process 3-4 times, creating layers in the stack. Then, I leave it in a clump, wrap it in plastic and put it in the fridge to chill for a half hour or so. Then, it’s time to roll out the dough. I take it out of the fridge, and break off about 2/3 of it. I put it in between parchment or waxed paper sheets. I roll it out pretty thin, and cut it just smaller than the Dutch oven lid. I carefully lift the circle and the lower paper sheet and lightly fold it in half, with the paper on the inside. I set this down into the Dutch oven, then unfold the other half. Finally, I peel off the paper. It’s tricky to position the dough after it’s placed, so it’s good to be careful as it’s going in. Then, I take all of the leftover around the circle, and the extra that I broke away earlier, and I roll that out, in a long rectangle. I cut that into strips, about an inch to an inch and a quarter wide, and about a foot long. Each of these strips are lifted up and placed around the inside side of the dutch oven. I press them together and also press into the “corner” where the bottom of the Dutch oven rises up into the wall. Presto! The crust is in place. Then, take a fork and poke holes in the bottom and the sides, to vent the steam. If my pie has a top crust, I’ll roll out another amount of dough and cut another circle about the size of the lid. using the same technique I lift it onto the filling and position it, unfolding it, onto the top of the pie. 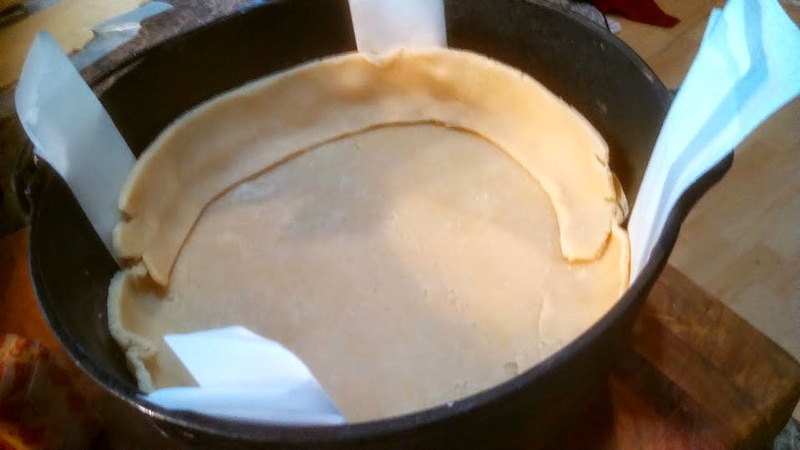 I’ll pinch the sides and the top crust together in a decorative way and cut stylish vent holes in the top (usually 3-4) so the steam can release and keep the crust from tenting. Then, I’ll brush the top of the crust with a little milk and sprinkle some more sugar over the surface. This helps make a nice sweet glaze. Now, in certain circumstances, it’s a good idea to parbake the bottom crust (also known as “prebaking” or “blind baking”). 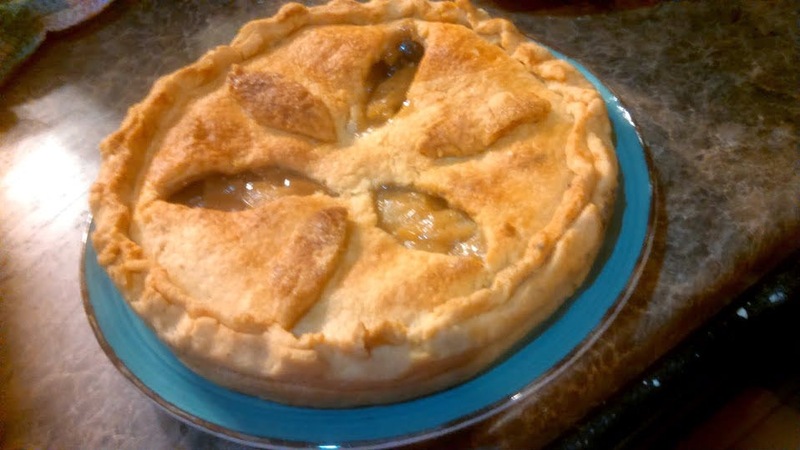 If you’re doing some kind of custard pie, or a particularly wet fruit pie, or if the filling itself will not be baked (like a cream or mousse pie). This will help set the flakiness and crispness of the crust before the wet ingredients are baked. I can’t think of a pie that might use a prebaked base with a top crust. Light some coals (probably just before you start rolling out the dough), and let them get white-edged. Pour some dried beans into the bottom of the crust, spreading them up the sides as well. This will help hold the crust down and prevent bubbling. Put the Dutch oven out on the coals, as listed above and let it bake. Now, in a conventional kitchen, in a preheated oven, a prebake will typically take about 10 minutes. In a Dutch oven, you have to heat up the iron, so a partial bake should be about 20-25 minutes. If it’s a cream pie, or something that won’t be baked, I’ll fully bake it, about 30-35 minutes, until the sides are brown. When it’s done, I take it off the coals and let it cool some. When I can handle it, I’ll scoop out the beans with a spoon, or my fingers, and then let it cool just a little more. At that point, the bottom crust is ready for pie! Then, when the pie is all filled, baked, and cooled, you can lift the pie out of the Dutch oven using the strips of parchment. It usually works best if there are two lifters, each person lifting two ends, but I've done it successfully by myself.